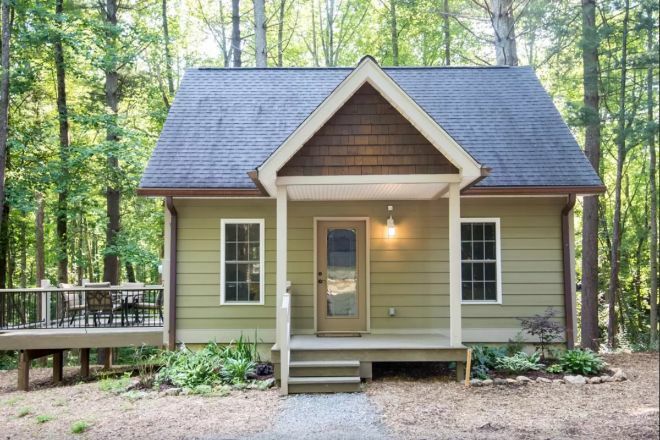 This cute, little tiny home for rent can be found in a 5.5-acre forest in North Carolina, so it's perfect for those seeking for a peaceful and quiet retreat and to get in touch with the mother nature. 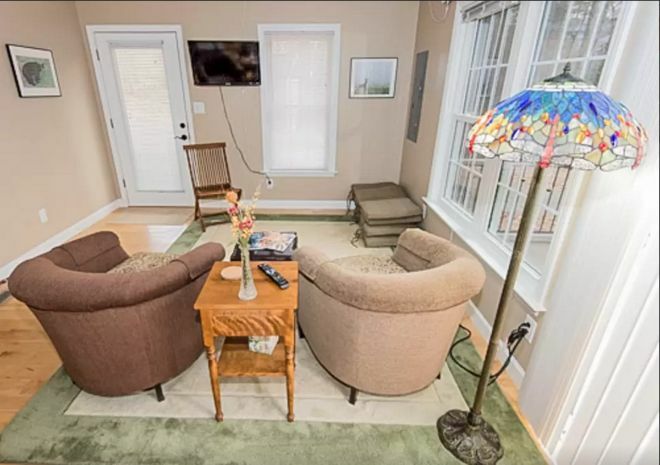 However, the house also is just 15 minutes away from the city of Asheville so, as its owner Doug puts it in his AirBnB post, you get the "best of both worlds!" 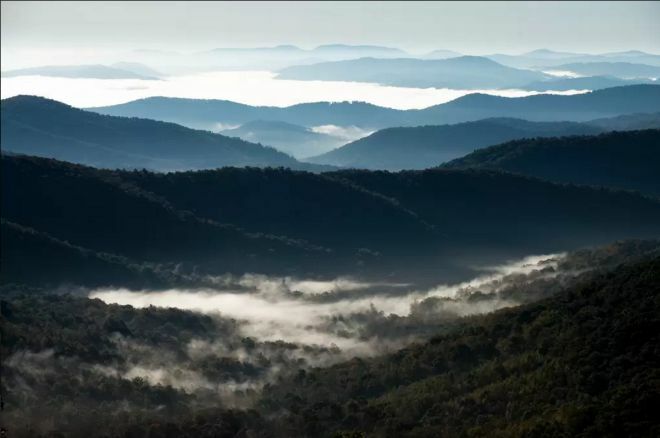 There's also an easy access from the house to the picturesque and beautiful Blue Ridge Parkway and the Smokey Mountains. However, as we know, location isn't everything when it comes to the perfect home or tiny home. 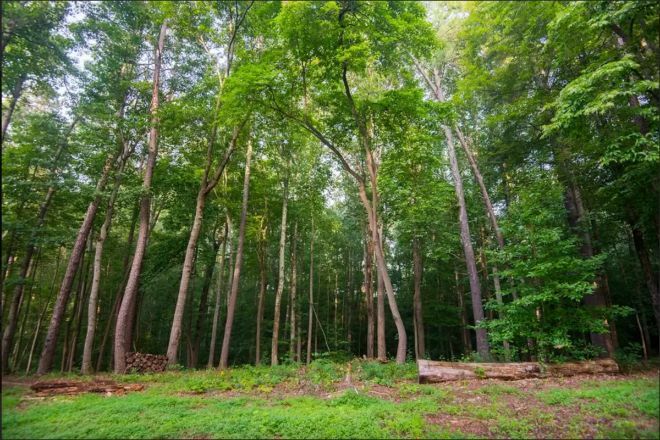 Even if the location is the lush forests of Western North Carolina. A house has to be functional and hopefully pretty, and sometimes that's not easy to get when it comes to a tiny home. This tiny cottage's facade is simple, yet darling. The double windows shower the inside in natural light. 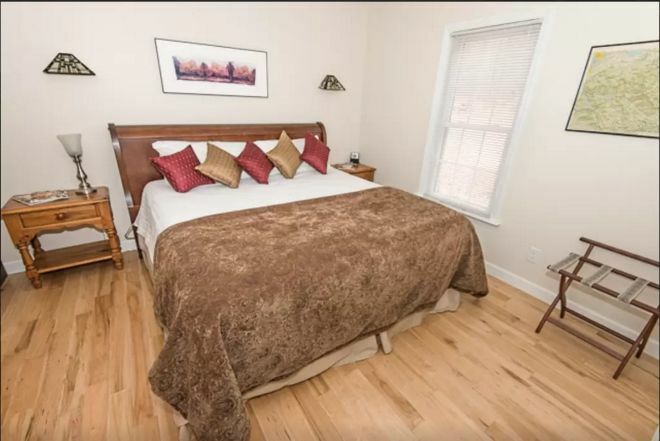 The king bed is completely new, and provides you with the comfort and rest you need after those long walks you would take in the surrounding forest. The living room has been decorated in neutral tones and in a very minimalist way, so the beautiful stained glass lamp really stands out against the background. The fully equiped kitchen is one of the greatest advantages of this home. 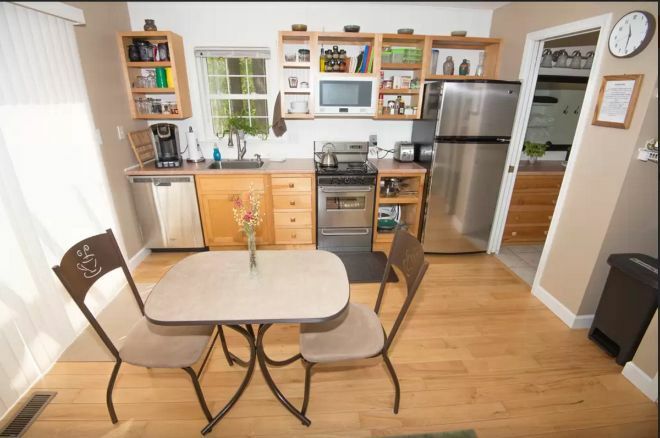 It comes with a full size refrigerator, diswasher, four-burner stove and oven, as well as all the small appliances you could think of: from a toaster to a microwave. Finally, the bathroom. A room where the owners have think of it all for the comfort of their guests. 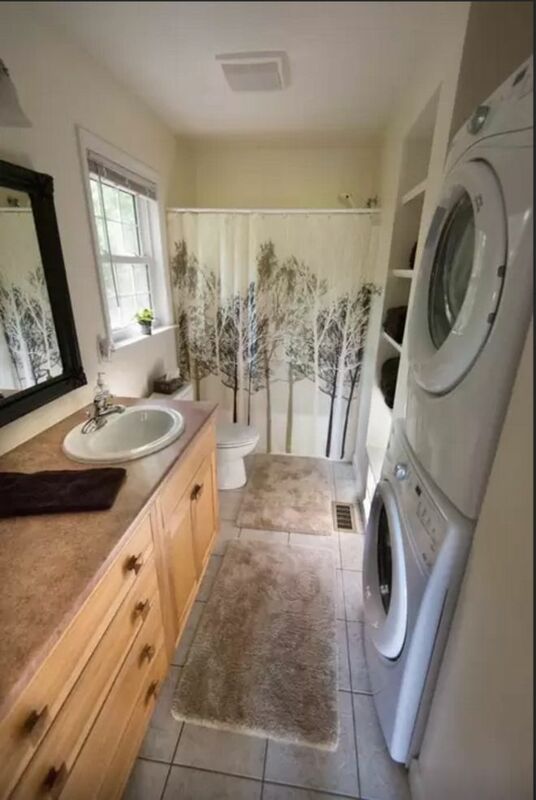 It not only is a complete bathroom with shower and bathtub, but also boasts something that we don't usually see in a tiny home: a brand new front load washer and dryer. In case this wasn't convenient enough, the owners also provide their guests with laundry soap and clean linens and towels. 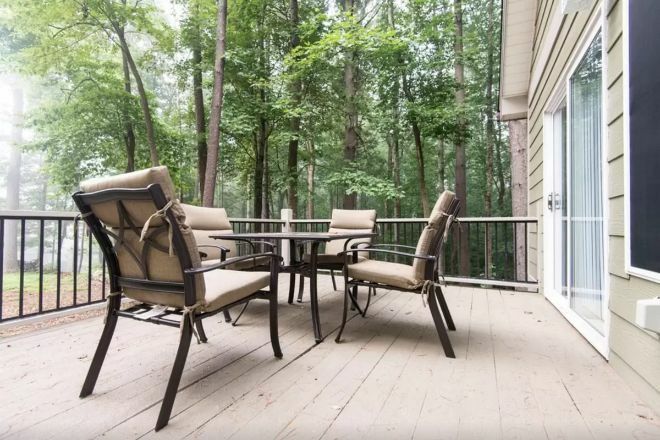 Finally, one of the best features of this house is - obviously, its gorgeous deck. Another thing you don't normally see in a tiny home. Having breakfast in this spot has to be absolutely delightful on a warm morning. 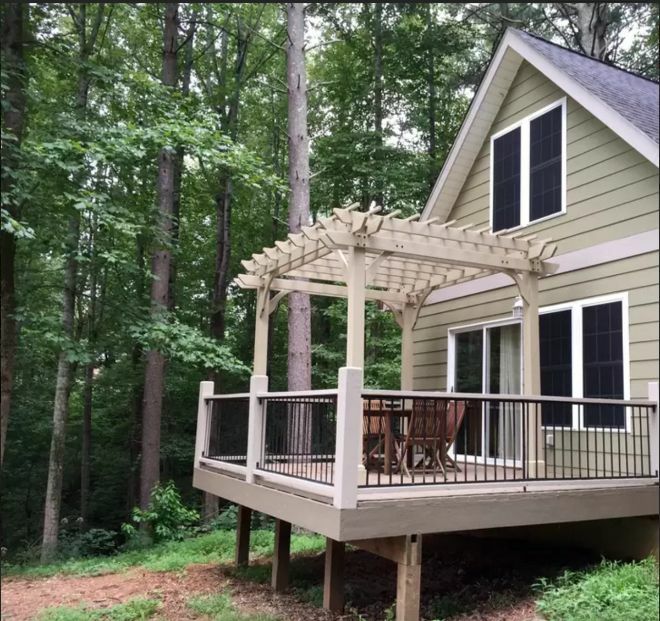 The beautiful views from the deck give this tiny abode an extra level of awesomeness. Imagine waking up to this gorgeous landscape! 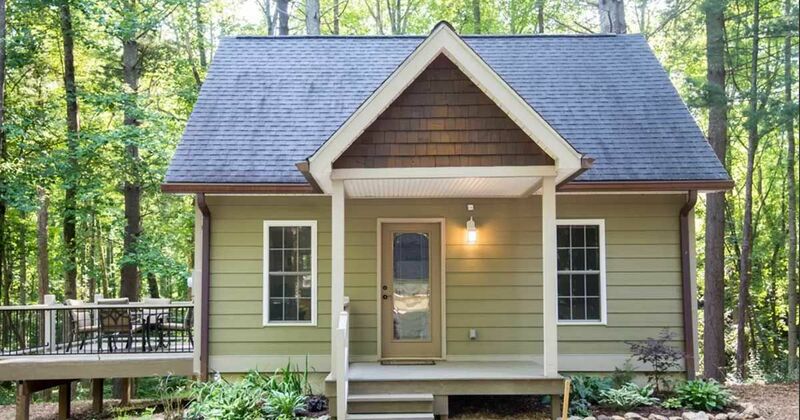 What did you think of this tiny woodland abode? Be sure to SHARE with other tiny home enthusiasts! Originally built in the 1980s, this home was recently expanded and remodeled by designer Leigha Heydt. Today, it's a bright and airy family home that boasts a perfect blend of Craftsman and contemporary style.